A subscription is designed to hold all information related to a single serial title. Therefore, each library is likely to have only one subscription per serial title. Add new subscriptions to a serials record that exists in the catalog. Select an owning library. The owning library indicates the organizational unit(s) whose staff can use this subscription. This menu is populated with the shortnames that you created for your libraries in the organizational units tree in Admin → Server Administration → Organizational Units. The rule of parental inheritance applies to this list. For example, if a system is made the owner of a subscription, then users, with appropriate permissions, at the branches within the system could also use this subscription. Enter the date that the subscription begins in the start date. Recommended practice is that you select the date from the drop down calendar although you can manually enter a date. 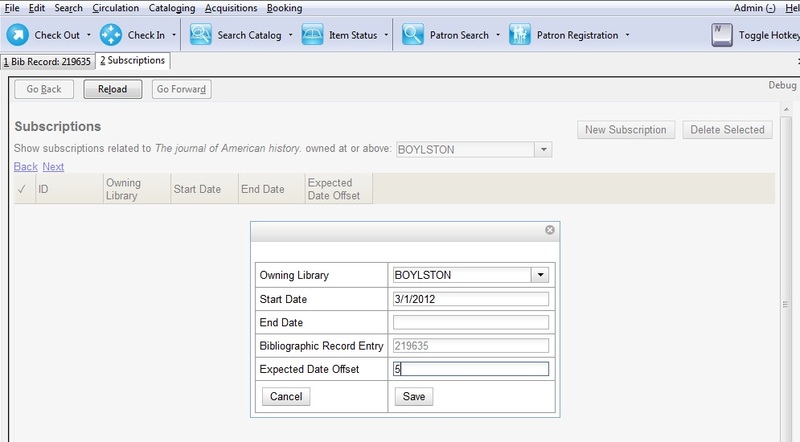 Owning library and start date are required fields in the new subscription pop up box. Enter the date that the subscription ends in the end date. Recommended practice is to select a date from the drop down calendar, but you can manually enter a date, also. Enter the difference between the nominal publishing date of an issue and the date that you expect to receive your copy in the Expected Date Offset. For example, if an issue is published the first day of each month, but you receive the copy two days prior to the publication date, then enter -2 days into this field. After you save the subscription, it will appear in a list with a hyperlinked ID number. Use the drop down menu at the top of the screen to view subscriptions at other organizations.